Honestly. If you weren’t born here, would you, could you, be a citizen? Sure, if you studied the given questions like pending citizens are, but what about those of us who went to public school and learned (or was supposed to learn) this stuff in class? This blog post has nothing to do with politics – really! This post has to do with schooling. I’m not political. I hate politics. I stick my fingers in my ears and say, “nah, nah,nah” anytime anyone starts talking politics. Government and history were my hated classes. I failed video class at a tech center because I would not give political opinions on a ‘skit’ we were doing. Have I mentioned I hate politics? However, I did some research. And it’s quite depressing. There are 100 questions on the new citizenship’s oral exam. All applicants are given all 100 questions, as well as the answers, in advance, and they are encouraged to study. When they sit down for the test, they are asked 10 at random; they have to get six of them right to pass. Question….could you? Sure if I was given the questions to study beforehand, but what about just knowledge from school. Could ya? Honestly? students surveyed would have passed the citizenship test. They were not given time to study. They should know this stuff! They live here. They just ‘learned’ it in school…didn’t they? Yet, 97% didn’t. That’s sad. Only 1 in 4 of the students knew who the first president of the US was. Really? In another bit, Newsweek gave 1,000 Americans the test. 38% failed. 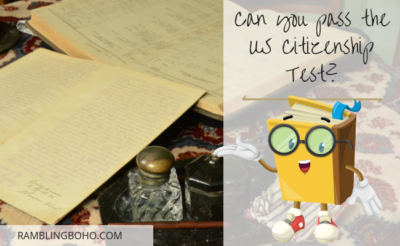 38% of Americans couldn’t pass the citizenship test! Appalling! 29% couldn’t name the vice president. 73% couldn’t correctly say why we fought the Cold War. 44% were unable to define the Bill of Rights. 6% couldn’t even circle Independence Day on a calendar. Wow. Just wow. I had my last civics class in 9th grade. That was…….1985, and I retained most of that knowledge. Huh. Of course, I was also taught it. Are these kids? My son was able to answer every single question in his book, and he elaborated on most of them. 🙂 And his civics teacher was giving him bad grades? What? Ugh. Anyway….this is why I homeschool. How many stars are there in our flag? How many stripes are there in the flag? Who becomes President of the United States if the President and the Vice-President should die? Who said, “Give me liberty or give me death.”? What holiday was celebrated for the first time by American colonists? What were the 13 original states of the U.S. called? Which President was the first Commander in Chief of the U.S. military?